The British Library has produced one of the most beautiful and informative books it has ever been my pleasure to see. 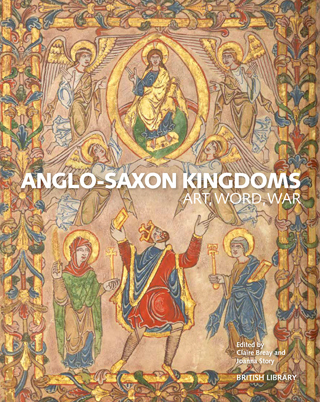 Anglo-Saxon Kingdoms has been produced to complement an exhibition on the ‘Art, Word and War’ of this fascinating era. Many of the exhibits are already in the care of the British Library and some others are on loan from numerous historic centres in the British Isles. Many more have been gathered together from the most important museums and institutions in the world and comprise some of the most important and beautiful documents and objects which have survived the huge vicissitudes of the last one and a half thousand years. Many have not merely survived, but have come down to us in all their original glory. The Codex Amiatinus, originally made at the monastery of Wearmouth-Jarrow, now on loan from Florence in its original and intact condition, and returning to England for the first time in 1300 years, The Domesday Book, England’s earliest surviving public record, and the awe-inspiring early English poem of the exploits of Beowulf, are just a few of the dozens of priceless and beautiful artefacts on show at the British Library from now until February 2019. The Anglo-Saxon period covers the time from the Roman exodus from England in the early fifth century, to the arrival of the Normans in 1066, an era that is so very often termed ‘The Dark Ages’, mainly because we have known so little of it in past years. Nowadays modern technology and dedicated archaeology have proved that the sobriquet should be instantly dismissed. One look at the skill and workmanship that was employed in making these beautiful artefacts, writing and illustrated documents in this book will tell us that the centuries that produced these wonders were in every sense the equal, and in many cases the superior, of our present-day artisans. Not only are these artefacts beautiful in themselves, they present to our modern eyes sets of laws that we can recognise to this day, writs or letters for quite simple things which evoke a sense of continuity down the ages and tells us that these people were not so very different from us, even though their circumstances may have been. This is a large and heavy book and comprises a mostly full page colour plate of each artefact, with an analysis of the same on the opposing or following page or pages. The historical academics who helped in the production of the book bring an accomplished elucidation to each object, which can only add to the enjoyment of seeing the exhibition in reality. To anyone with even the slightest interest in the history of the Anglo-Saxon period, this beautiful book, and the spectacular exhibition which it introduces, will cement their interest in the era. To those of us who have always had a keen interest in, for instance, the likes of Alfred the Great, or the Danish King Cnut, or the multi-talented Venerable Bede, our interests will be solidified and advanced, and we should be ever grateful to the British Library for making it possible for us to see these objects in all their glory, once again cherished and held in the same esteem that they once were in those far off “Dark Ages”.